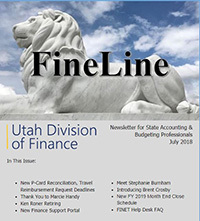 The Division of Finance publishes "FineLine," a newsletter designed to help and inform users of FINET, the state's accounting system. Readers find pertinent articles, training tips, answers to common questions, important dates to remember, and information on new initiatives. Contact Kurt Kleckner with comments and suggestions for articles, or if having trouble accessing the newsletter.